Collaboraction, Chicago's social issue-driven contemporary theatre, has been presenting a line-up of 21 new, crowd-sourced works for its first-ever PEACEBOOK Festival, a collaborative city-wide festival of theatre, dance, music, visual art and spoken word focused on cultivating peace in Chicago, presented August 12-27 as part of the Chicago Park District's Nights Out in the Park program. 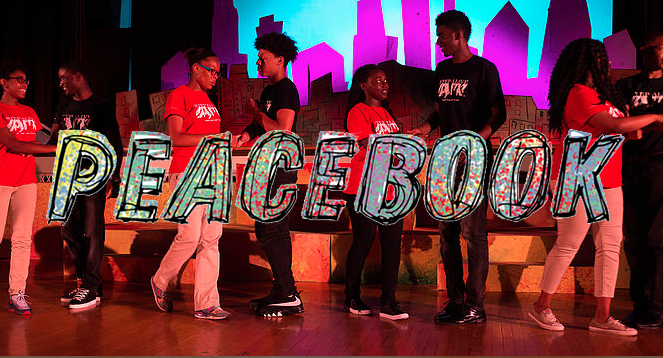 Participating artists who have created new works for PEACEBOOK include GQ of the Q Brothers, Sir Taylor, Universes (directed by Cheryl Lynn Bruce), Yuri Lane the Chicago Beatbox LTD, the Step-Alive Dance Team from Englewood, and many more. Collaboraction created PEACEBOOK as a way to engage new artists, audiences, and communities in creating and sharing art that envisions a more peaceful Chicago. Each PEACEBOOK performance is a fast-paced collection of seven diverse, world premiere pieces of theatre, dance, and spoken word, each seven minutes or less, uniting Chicago artists citywide, and creating real connections with Chicagoans in communities around the city. 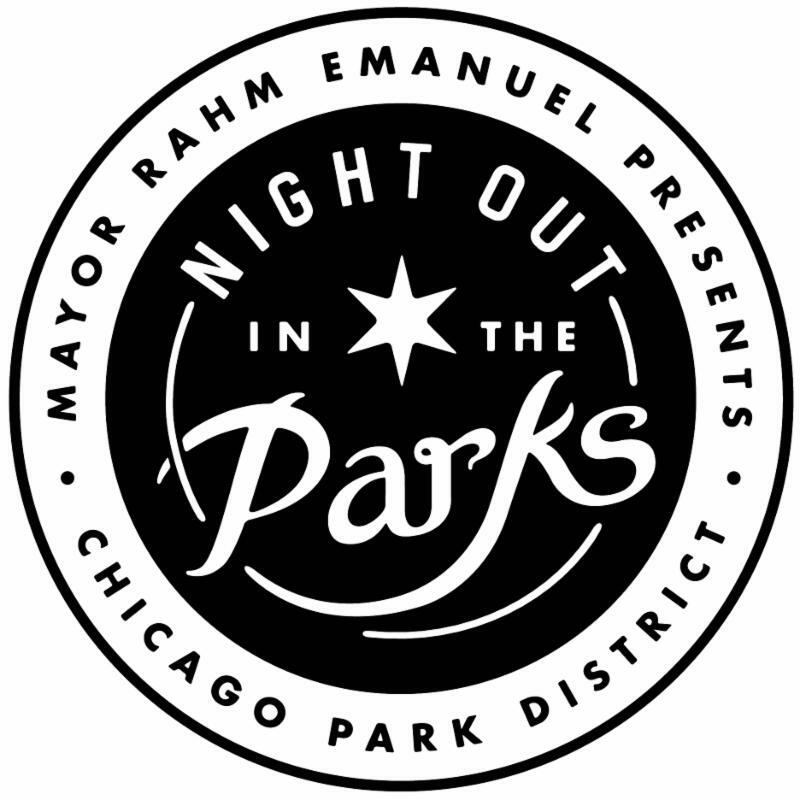 Prior to each show, there will be a free community meal and peace fair with panels, workshops, and community organizations from a diverse line up of Peacemakers in Chicago. Additionally, each night features a different musical guest. 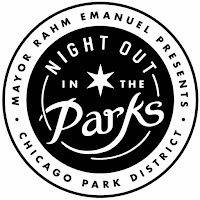 Hamilton Park, 513 W. 72nd St.
Clarendon Park, 4501 N. Clarendon Ave. Prior to each show, the house will open with a free community meal and peace fair with panels, workshops and community organizations from a diverse line up of Peacemakers in Chicago. Each night also features a different musical guest. To reserve FREE tickets, email boxoffice@collaboraction.org. For more information, visit collaboraction.org. "From our 15 years of producing SKETCHBOOK, we know the power of an arts festival to build community, create artistic collaborations and launch careers, so we are delighted to bring our proven SKETCHBOOK format to the Chicago Peace Movement," said Collaboraction Artistic Director Anthony Moseley. "We are delighted to announce these 21 new works of art that individually and collectively explore the meaning and root cause of peace. We are creating new collaborations in which established Chicago theatre artists are working with talented emerging artists from the neighborhoods of our park district locations. This is bringing together a new community and sending a new message to Chicago. And the shows are going to be full of energy, much like SKETCHBOOK, with live music and dance pieces and free food." "We encourage all Chicagoans who want to be a part of the Peace Movement to join us as an artist, audience or volunteer. We must all come together and address the biggest issues of our times, the epidemic of violence and inequality that is the result of 200 years of segregation. Theatre can unite us and activate us." Friday, August 26 at 7 p.m.
Saturday, August 27 at 7 p.m. There are over 20,000 homeless youth in the city of Chicago. What happens to the things that are most important to us after displacement? This devised piece aims to bring awareness to a Bag and Tag service that will keep our homeless youth in possession of their most important belongings. This piece will feature amazing beatboxers from around the Chicago area, including an interactive beatbox symphony conducted by Yuri Lane, also known as the Human Beatbox. Littman and Raiselis are interviewing Uptown residents, business owners and workers with a central question: What does it mean for Uptown residents to coexist? The answers will be shaped into a hyper-local performance piece that touches on not only the neighborhood's concerns, but also its gifts, strengths and joys. A narrative from a 12-year-old bootlegger brings attention to the difficulty of making a living in a difficult neighborhood, and how police bias and brutality lead to unjust actions against people just trying to survive and find peace. Peace is a good thing, and this city of marches and protests is hungry for it. A dance piece about Chicago's fight for unity and love. Still Acting Up is an audition-based senior citizens theatre troupe who hopes to debunk the myth of what it means to be a senior involved in the arts and wants to inspire audiences to action. A spoken word ensemble piece about ignorance and privilege that shows how everyone must do their part to open their eyes and help fix the world's problems even though they may not be directly affected by some of them. Musical guest August 26 is TBA. Musical guest August 27 is Nicholas Tremulis. Chicago artists participating in PEACEBOOK include Collaboraction Artistic Director and PEACEBOOK Festival director Anthony Moseley, director Cheryl Lynn Bruce, Jennifer Chambers, Jenny Lynn Christoffersen, Justin Dietzel, Luis Crespo, Spencer Diedrick, Justin Dietzel, Melanie Flores, Yuri Lane, Ana Maria Martinez, Sophia Pietrkowski, Schoen Smith and John Weagly. 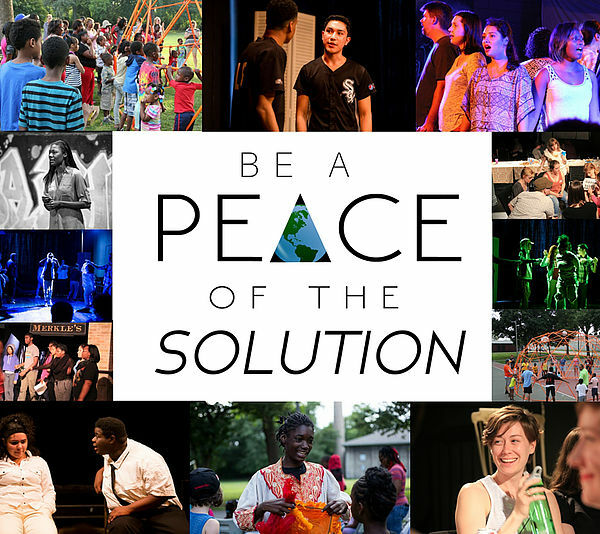 PEACEBOOK is also funded in part by The Goodman Theatre and the NEA. 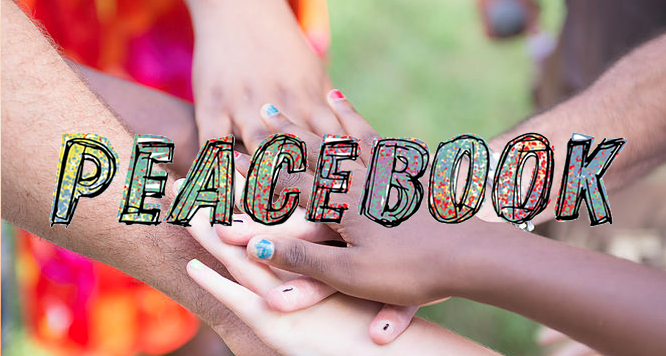 For further PEACEBOOK updates, visit collaboraction.org, follow the company on Twitter, Facebook, Tumblr, YouTube or Instagram, or call the Collaboraction box office, (312) 226-9633. 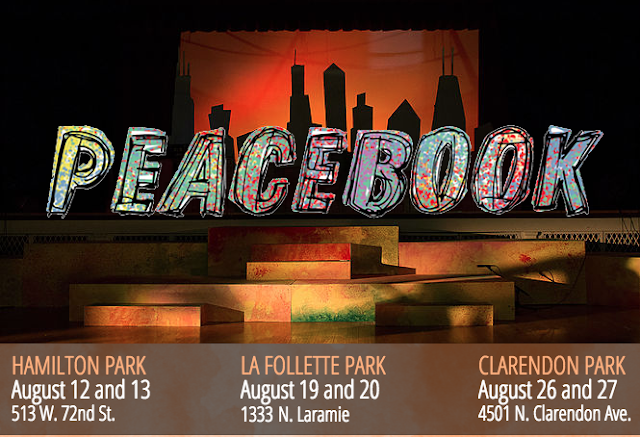 Following PEACEBOOK, Collaboraction invites Chicago audiences to a diverse and electric 21st season in 2016-17 tackling critical social issues of peace/non-violence, mental health and gender issues. In October, Collaboraction will introduce The Mars Assignment, a world premiere about several characters fighting depression, written and directed by Ronan Marra and created in collaboration with Collaboraction Company Member Elsa Hiltner. In February, Collaboraction debuts Gender Breakdown, a daring, provocative world premiere written by Dani Bryant and directed by Erica Vannon. A devised piece that speaks to the work of Erin Pike and Courtney Meaker, Gender Breakdown will explore female roles in the theatre by examining and deconstructing various text, genres and media of both past and present. 1579 N. Milwaukee Ave., Room 300, at the epicenter of Chicago's Wicker Park and Bucktown neighborhoods. The company's collective three-space venue, Collaboraction Studios, includes The Pentagon, The Vault and The Salon. These encompass 8,000 square feet on the third floor of the historic building, and are home to Collaboraction's own productions as well as a wide variety of visiting Chicago theater and dance companies and comedy groups. Collaboraction Studios are also home base for Collaboraction For-Hire, which creates custom special event design for private, corporate and civic clients, including the Art Institute, the City of Chicago, and more. Collaboraction is led by Artistic Director Anthony Moseley, Executive Director Darcy Addison and a dedicated staff and board of directors. Collaboraction is supported by Bloomberg Philanthropies, The Gaylord and Dorothy Donnelley Foundation, Richard H. Driehaus Foundation via the MacArthur Foundation, and the Wicker Park & Bucktown SSA #33 Chamber of Commerce. This program is partially supported by a grant from the Illinois Arts Council Agency.